The hustle-and-bustle of the holiday season means many people will need to hit up the bank or ATM for last-minute cash gifts. Depending on where you do your banking, this can be difficult because many banks follow a holiday schedule and may have altered hours. 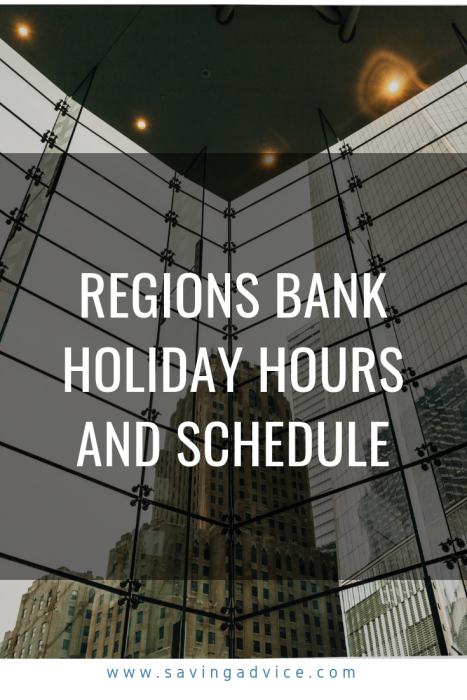 Below you’ll find the information for Regions Bank holiday hours and the bank’s holiday schedule for 2019. Like many other banks, Regions Bank will maintain regular hours through the holiday season. In most cases, the bank will be open from 9 a.m. until 5 p.m. Monday through Friday. Around Christmas and New Year’s, these hours may vary. Christmas Eve: Most Regions Bank locations will close early on Christmas Eve. You’ll want to call ahead to verify your bank’s hours that day. Christmas Day: All banks will be closed, along with most businesses. New Year’s Eve: Many banks, including Regions Bank, will close early on New Year’s Eve. New Year’s Day: Regions Bank (and just about every other bank nationwide) will be closed New Year’s Day. If you want to verify the hours for your specific branch, it is always a good idea to call ahead. You can also check your bank’s website. For the most part, banks follow a similar holiday schedule. However, banks located within retail locations may be open on select holidays throughout the year depending on their policy. You can expect Regions Bank to be closed on the following holidays throughout the year. Note that if one of these holidays falls on a weekend, it might impact bank hours the day before or after the holiday. For instance, Veterans Day fell on a Sunday this year. Because banks are normally closed on Sunday, most institutions remained closed on Monday in observance of the holiday. If the holiday falls on a Saturday, it is likely banks will close the Friday before. As always, if you can’t make it to the bank before they close there are a number of other ways to perform the transactions you need to get done. Most banks have 24-hour ATM access 365 days a year. So, if you need to make a deposit or withdraw cash, you can do it at the ATM. You can usually make transactions like transfers and bill payments through your bank’s mobile app or website. Keep in mind that any deposits, bill payments, or transfer requests may take longer to process due to the holiday. Most banks will notify you that your transaction will be posted to your account the following business day. Which Banks Are Open on Sunday?